The 12 Annual Polish Mountain Hill Climb is being held at a unique time of the year in Mountain Mountain due this Summer’s unusually wet conditions. This year’s event is scheduled for Fri-Sun, October 12, 13 and 14. 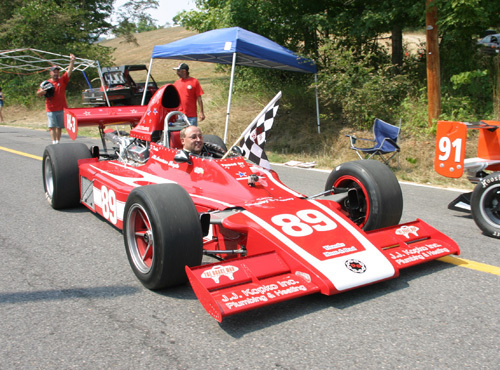 More than a decade after we first obtained permission from the Maryland General Assembly to hold sports car competition on local public roads, we are excited to 12th Annual Polish Mountain Hill Climb on Gilpin Road, just east of Flintstone. The Weimer Automotive Group and Potomac Farms Dairy have committed new financial contributions and in-kind support to the Flintstone Volunteer Fire Department to help that organization partner with National Road Autosport in host sports car racers from nine different states competing in the Pennsylvania Hill Climb Association Series. Our annual kick-off cruise-in party has been moved to the paddock field for this special October date. Our two days of SCCA time trials on the mountain would not be possible without our long term partnerships with the Flintstone VFD, Maryland SHA, the Sports Car Club of America, local law enforcement and public safety agencies. Our paddock is a donated and groomed field 100 yard west of the starting line as their base of operations owned and offered free of charge for the event by T.R. Robinette. Working with the Maryland State Highway District 6 office, we have developed a plan over the years that affects the smallest possible number of local residents. On Saturday and Sunday, the event will follow a prescribed outline of road signs and traffic control points manned between 6 AM and 4:30 PM. There are half a dozen or so households inside the area of closed roads. Those residents will be able to come and go as needed, with help from personnel at the road closure checkpoints. Spectators are encouraged to park on MD 144 east of Flintstone and use shuttle transportation to access the competition area. The paddock area will be open from 8 AM to 4:00 PM on Saturday and Sunday, allowing spectators into the competition area and allowing time for workers and spectators to get up the hill to course worker stations and spectator areas on the hill itself. More information is available on Facebook by searching Polish Mountain Hill Climb.